I’m just going to throw it straight out there. If I was getting married again (same fella, don’t fret pet), Middleton Lodge would be the one. A true gem in the Yorkshire countryside, which just keeps getting better and better – I mean there are plans for a spa… hello! Middleton Lodge has evolved into the ultimate venue with enough options to accommodate your wedding day visualisations effortlessly, and enough style to give you all the heart eyes. For the foodie’s amongst us, the Kitchen Garden is the thing of dreams, and if your guests love a party then the Old Forge Barn is where it’s at. Excited? You should be. Located in 200 acres of private North Yorkshire countryside, Middleton Lodge is a Georgian country estate unlike anywhere else in the North of England. From the 18th century Main House, the restored honey-coloured Coach House to the tranquil Kitchen Garden, this Georgian country estate is your home for the day. Hold your ceremony in the Main House, set in its own private gardens with views across the rolling Cleveland Hills. The country mansion has four stunning reception rooms, including Library Bar and Billiard Room, all arranged around a sweeping staircase in the Central Hall. This house is still home to the Allison family, and is only available for exclusive weddings and private parties. At the Kitchen Garden and The Fig House expect feast tables, seasonal menus based on sharing boards and carefully crafted cocktails using garnishes picked from the Garden. The wedding party will have exclusive use of the Boiler House Bar, and bedrooms in the Farmhouse, Potting Sheds and Dovecote. Guests can party into the night at The Old Forge Barn just a short two-minute walk through the estate grounds, with a late night bar, open until 2am. For those looking to hold their wedding at The Coach House, the award-winning boutique hotel and restaurant on the estate, the whole estate has to be exclusively hired. The entire 200 acre Georgian country estate becomes your home for the day. 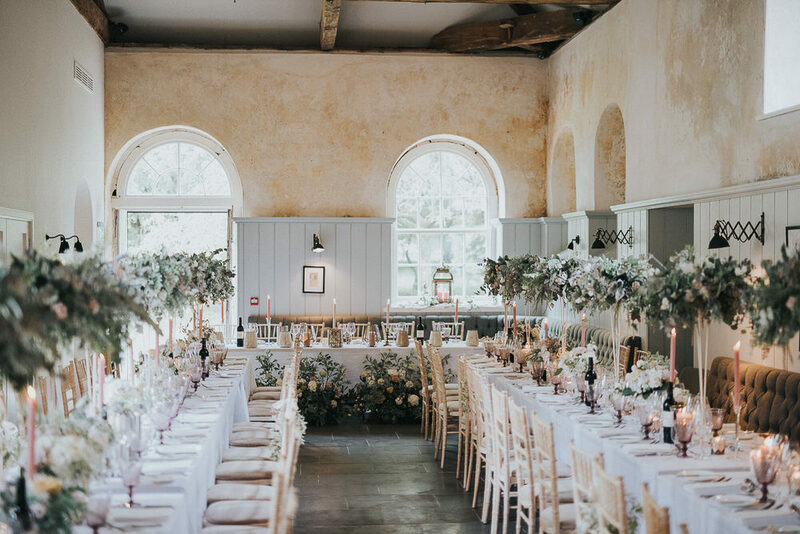 So take your pick from the traditional Main House for the ceremony, the stunning Coach House for your wedding breakfast created by renowned head chef, Gareth Rayner, and for those looking to party into the night, choose between the cosy Old Forge Barn or the brick vaulted Cellar Bar. After all, it’s all yours for the day. “My wife and I got married here on 18/08/2017. I can not speak highly enough of the venue, the food and most of all the staff. Friends who have attended weddings here told us that the staff were good…..they were not just good but absolutely bloody fantastic. Anna, Tracy and Anna were involved throughout the planning and day of our wedding, they are absolutely amazing and did everything to make sure our wedding was a day we will never forget. Hopefully we will attend weddings here again as guests in the future, we will definitely be back in the next few months to the Coach House for tea and an overnight stay. “We have just had the most memorable weekend attending our daughters wedding, the guest house and hotel was fantastic. Special thanks to Anna and the wedding team who excelled in everything to make the day run so smoothly. Will be returning as we could not fault anything from the staff, bar and restaurant truly remarkable. Once the future developments are completed and the spa arrives it will be heaven. Don’t forget to visit Middleton Lodge and the wealth of other talented industry professionals who have been handpicked for The Love Lust List. All have the desire to assist you in creating the day you’ve been dreaming of, so what are you waiting for? Critically acclaimed landscape designer, Tom Stuart Smith, designed the Kitchen Garden. Renowned for his work in the gardens of the Royal Palaces, show gardens at The RHS Chelsea Flower Show and other high profile projects across the UK and internationally. The Coach House at Middleton Lodge is a Mr & Mrs Smith Hotel. The Middleton Lodge Estate wedding team was recognised at the national Wedding Industry Awards 2017 (TWIA) as Events Team of the Year after the amazing feedback and nominations from former brides. The Middleton Lodge Estate is still very much a private family home, with the Allison family designing, managing and overseeing all parts of the estate’s hotel, wedding, restaurant and all upcoming projects. The Middleton Lodge Estate is ideally located in the north of England; the Georgian country estate is only a five minute drive from Scotch Corner on the A1, forty minutes from Newcastle, one hour from Leeds and 2.5 hours from London by train. The Coach House is a 2 AA Rosette restaurant and comes highly recommended in the Michelin Guide 2017. You can find Middleton Lodge in our Yorkshire Venues category of The Love Lust List.